Open-source hardware accelerates the time-to-market and reduces development risk, as designers can easily develop their custom carrier board based on their specific interface requirements and budget constraints. 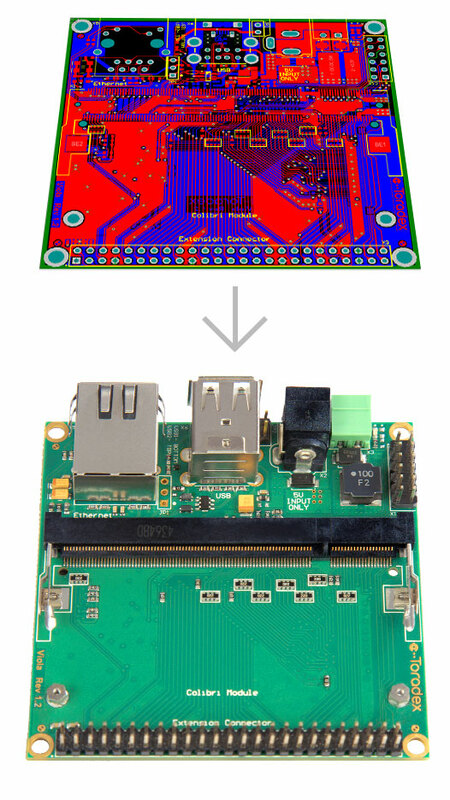 We simplify your development of custom carrier board, which are compatible with our Computer on Module (CoM) / System on Module (SoM), by offering free reference designs, tools and documentation. We provide reference designs of our off-the-shelf carrier boards in electronic format. These reference designs include all schematics, layout and IPC-7351 compliant component libraries in Altium designer format. You can use these files as reference while designing your carrier board. We offer extensive documentation that can help you in developing and designing custom carrier board for Apalis and Colibri modules. The design guides offers details about the various interfaces and contains reference schematics. The layout guide contains general guidelines that will avoid signal integrity and EMC issues in the carrier board. We have an extensive proven partner network that includes 3rd party companies offering hardware services for design, development and manufacturing of custom carrier boards, which are compatible to our modules. These partners will help you reduce the risk and time involved in custom carrier board development. This video will offer detailed information on various topics that will help you during Custom Carrier Board Development. The video will guide you on various free resources offered by Toradex, and this makes your custom board design less risky and less time-taking.